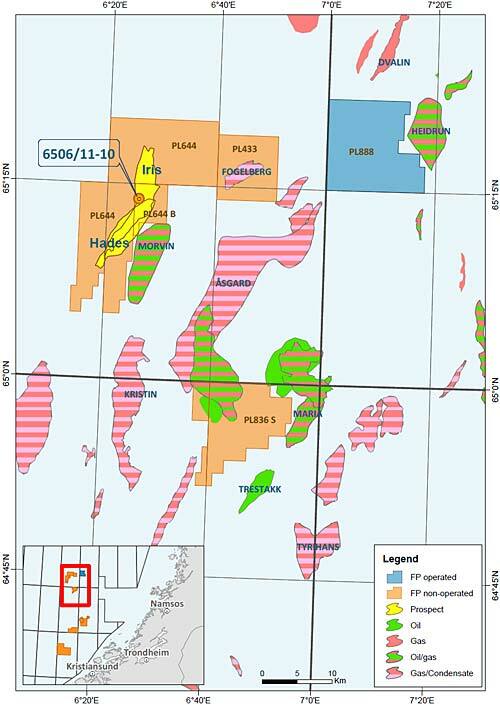 Faroe Petroleum, the independent oil and gas company focusing principally on exploration, appraisal and production opportunities in Norway, the UK and Atlantic Margin, has announced the commencement of the Iris/Hades (Aerosmith) exploration well, 6506/11-10 (Faroe 20%) in licence PL644/PL644 B. The Iris/Hades (Aerosmith) well is located in the Halten Terrace, some 200 kilometres offshore in the Norwegian Sea and adjacent to the producing Morvin and Aasgard fields, operated by licence partner Statoil. The well will target two formations, one in the Cretaceous and the other in the Jurassic.The Cretaceous Hades prospect is a closure on the flank of the Sklinna Ridge, with the Jurassic Iris prospect located directly underneath, within a rotated fault block. Licence PL644 and PL644B (Faroe 20%) were awarded in February 2012 and are operated by OMV (30%) with partners Statoil (30%) and Centrica (20%). The semi-submersible drilling rig, Deepsea Bergen, will be used for the drilling operations. Results will be announced when operations have been completed, which is estimated to take approximately 90 days. “We end 2017 in a great position, with a pipeline of high quality, world class development projects, to grow materially our production and with a very strong balance sheet, which we recently further strengthened with the successful issue of a USD 100 million unsecured bond. I look forward to updating the market on Faroe’s progress in early 2018,” adds Stewart.